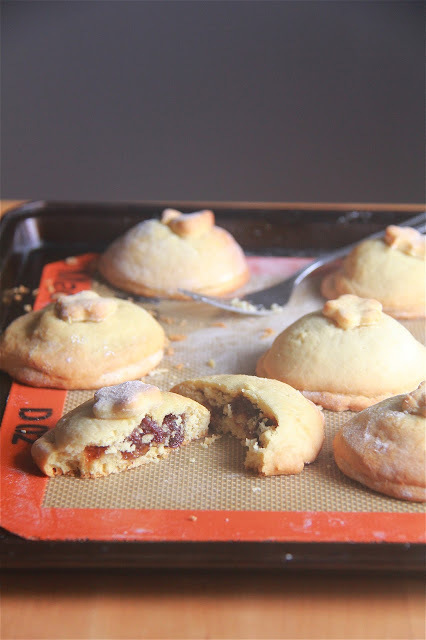 Crumbs and Cookies: filled raisin cookies. When I saw these cookies on Brown Eyed Baker, I was sold. They sounded so fabulous but the fact that the dough needed rolling and stamping out deterred me from making these for a while. Finally, I had enough time and patience to spare and thus, I made these cookies. These cookies are definitely worth all the trouble. The dough portion was soft, cakey and lightly buttery, and the raisins were so juicy. I had one while it was still warm and after the first bite, I thought that these cookies are possibly one of the very best cookies I've ever tasted. They had a old-school edge to them that make them even more appealing. 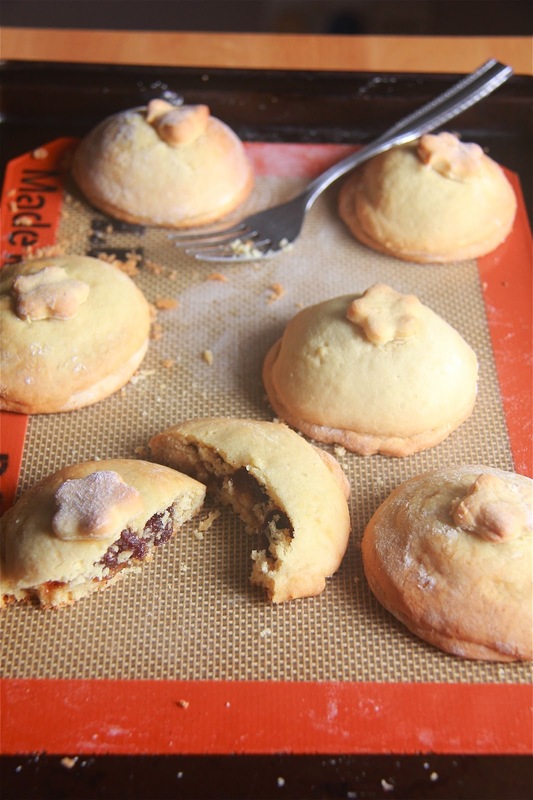 This recipe also marks the first time I've ever baked cookies with margarine. Usually that's a huge offence in my books (butter all the way! 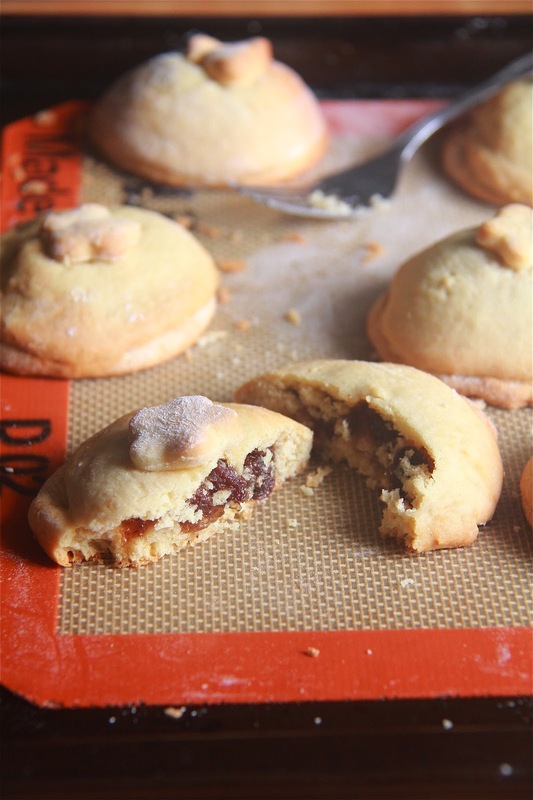 ), but it works well in this recipe because it yields cakier cookies. I realized that baking with margarine can be incredibly convenient. For one, you don't have to wait for it to soften to room temperature because it's already spreadable when cold. In the same way, it makes the dough soft and pliable even when thoroughly refrigerated. That means that you don't have to wait for the dough to soften before rolling it out if you had made the dough way in advance. Plus, margarine has a lower fat content but who am I kidding- the number of cookies I'll inhale in total will negate all possible calories saved. The instructions for making the dough is decidedly weird but keep faith, keep following and the dough will turn out fine. Although I think that the cookies are wonderful as they are, I do believe that the raisin filling could benefit from brown sugar instead. Of course, feel free to adhere to the original recipe. Make the filling: Whisk the sugar, cornstarch and 1/4 cup water to form a paste. Stir in the remaining water, lemon juice and raisins and place the pan over medium heat. Cook, stirring frequently, until the mixture thickens and raisins plump, 5 to 10 minutes. Cool to room temperature before using. Make the dough: Cream the sugar and margarine together until light and fluffy. Add the salt, eggs, milk and flour and mix just until the flour has been incorporated. Stir in the baking powder, baking soda and vanilla extract. Cover with plastic wrap and refrigerate for at least 30 minutes to 1 hour. The dough will be very soft and sticky. Preheat oven to 400F. Prepare baking sheets. Using about 1/3 of the dough at a time, roll out the dough on a well-floured surface to about 1/8 inch thickness. Cut the dough into rounds with a 2 3/4 inch cookie cutter or a 2 inch one for smaller cookies. Place one on a prepared baking sheet, spoon some raisin filling onto the circle and then top with another round of dough. Although the rounds will seal themselves together during baking without having to manually tamp the edges down, you can do so for a neater seamless appearance. Repeat with remaining dough and filling. Bake cookies until lightly golden brown on top, around 15 minutes (10 to 12 minutes for the smaller ones). Allow to cool for about 10 minutes on the baking sheet before transferring to a wire rack to cool completely.